Both Dr. Mary Lee Amerian and Dr. George Anterasian recently attended the American Society of Laser Medicine and Surgery meeting in Orlando. This is the largest and most prestigious laser meeting in the world. We have attended this particular meeting every year for many years in order to ensure that we always offer our patients the best and most up to date treatments available. One of the most exciting aspects of the meeting was the discussion of non-surgical facial rejuvenation. At the meeting, experts from around the country consistently recommended the combination of Fraxel laser therapy and Thermage to rejuvenate the skin of the face. For this reason, our office has decided to offer a special rate on both of these procedures during the months of May and June. As the weather warms up and we head into summer, this will allow more of our patients to take advantage of the benefits of these procedures. Dr. Amerian and Dr. Anterasian are proud to announce that we are now among the most experienced Fraxel Laser practitioners in Southern California. The Fraxel Laser represents a revolutionary technology in facial rejuvenation, and our office was among the first in the country to obtain this device. The Fraxel Laser is the only laser made today that utilizes a new technology called Fractional Resurfacing. With Fractional Resurfacing Technology, the desired results are obtained by treating a fraction of the skin’s surface at a time. During the treatment, microscopic closely spaced laser spots are delivered to the skin, while simultaneously preserving normal healthy skin between these spots. This preservation of healthy skin between the laser spots results in rapid healing following the laser treatment. The Fraxel Laser has been FDA approved for the treatment of wrinkles around the eyes and the treatment of age spots, sun spots, and sun-damaged skin. We are using this laser to accomplish full facial resurfacing. Clinical studies suggest that an effective treatment plan is four or five laser sessions, spaced one to two weeks apart. Results are immediate and progressive, with the optimal cosmetic result visible a few months following the last treatment. Patients have been quite pleased with their results. Treatments with the Fraxel Laser have no significant recovery downtime. There is no need for pain medicine after the treatment because any discomfort is minimal. The skin may have a pinkish tone for a few days, which is a normal sign that the skin is healing. Patients can return to work immediately following their treatment or the next day. Although a series of five Fraxel Laser treatments normally costs approximately $5,000 during May and June we are reducing the price to $3950. We are currently holding consultations with patients who believe they would benefit from this new laser technology or who have questions about it. Patients are invited to contact us or to call us at 310-829-9396 and make an appointment to discuss Fraxel Laser treatments. The Thermage Procedure is a new method for smoothing wrinkles and tightening and lifting the skin on the face without surgery, chemicals, or needles. The Thermage Procedure is FDA approved for the non-surgical treatment of facial wrinkles. Ideal candidates for the Thermage Procedure have thin or medium thickness skin, and mild or moderate facial wrinkling. The procedure can also be used to treat areas of the face that are still loose after a surgical facelift. During the procedure, the treatment tip simultaneously heats and cools the skin. It emits radio frequency energy to heat the collagen in the deeper layers of the skin, while protecting the top layers with a cooling spray. The heating action causes the collagen in the skin to tighten immediately. In addition, over the next few months, the procedure stimulates the production of new collagen, further enhancing the result. 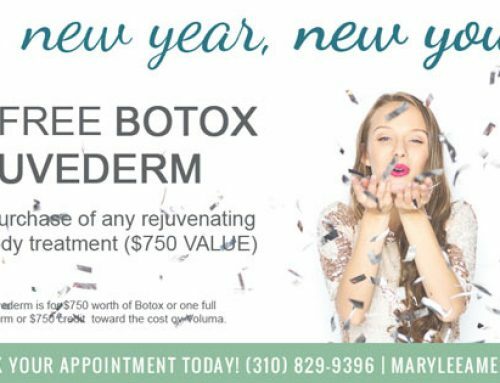 The combined action of the immediate tightening of collagen and the production of new collagen results in a tighter skin, improved skin texture, and a more youthful appearance. The optimum result is generally achieved approximately three or four months following the procedure. The procedure can also be repeated to further enhance the result. The Thermage technique has recently been changed. We now use lower energy levels to make the procedure more comfortable, and we treat the tissues multiple times using a faster treatment tip.This new treatment method produces a better cosmetic result for patients. In addition, with this new technique, the pain some patients had with earlier Thermage Procedures should now no longer occur. We are pleased to announce that we are reducing the price of the Thermage Procedure during May and June so that more of our patients can benefit from this procedure. Although the regular price of the Thermage procedure is $2,500 for the face, tissues under the chin, and upper neck, during April and May we are reducing the price to $1,950. In some physician offices, a nurse performs the Thermage Procedure. However, in our office, only highly trained and experienced board certified physicians perform this procedure. 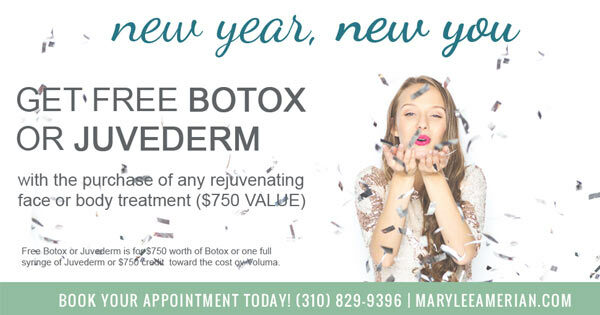 If you have developed some aging or wrinkling of your face and you’re interested in exploring the option of tightening and toning your skin without surgery, please feel free to contact us or call us at 310-829-9396 and make an appointment for a consultation with either Dr. Amerian or Dr. Anterasian.